There’s only one way to host a tea party. With the Mad Hatter! This Alice In Wonderland Tea Set will make it easy to invite him. And his riddles. Alice In Wonderland Tea Set. 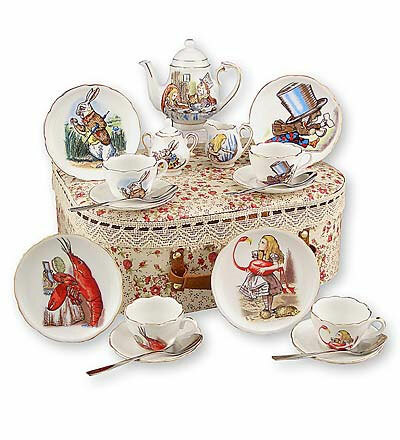 This heirloom-quality tea set features a beautiful collection of illustrations from the original Lewis Carroll story. Each porcelain piece is hand-finished in 24k gold and-like all Reutter tea services-is food and dishwasher safe. So it’s elegant, yet practical. Set includes four 3-3/4″ plates, four 1-1/2 oz. teacups and saucers, four stainless spoons, a 3-1/4″ tall teapot, sugar bowl and creamer. All neatly packed into a custom fabric sided storage container. For ages 5 and up.